Gettysburg day three. 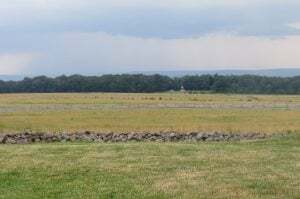 July 3, 1863 was the third and final day of the Battle of Gettysburg. It was Lee’s last chance to break the Union lines. His plan was to charge right through the center of the Union line and split them in two. 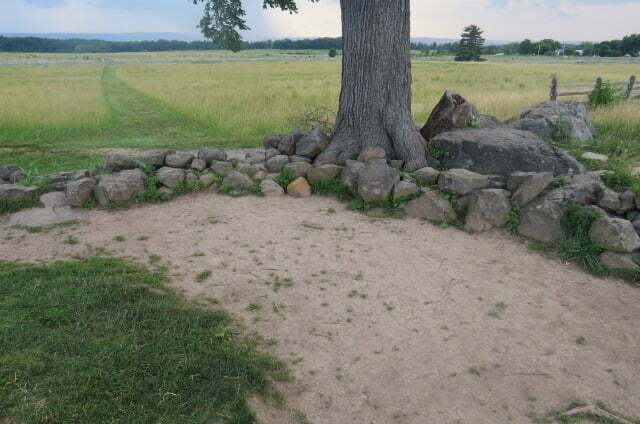 During the night both sides were continually reinforced bringing both of their troop strengths back up to where they had been at the beginning of the battle of Gettysburg. Early in the morning the Union struck first. General Slocum attacked Confederate troops at Culp’s Hill to regain territory lost the previous day. This fight lasted for a good 8 hours finally forcing the Confederates to retreat off of Culp’s Hill. While this was taking place Lee was planning the main attack at Gettysburg. This was of course the famous Pickett’s Charge. General George Pickett and his division had just arrived on the night of July 2nd. Followed by the arrival of Jeb Stuart and his cavalry. Lee was not happy with Jeb Stuart because of his long absence from the battle of Gettysburg, but quickly overcame his anger and set out the plan for the day’s attack. General James Longstreet would command Pickett’s division. Pickett would command his three brigades and would also be in command of two brigades from Anderson’s division. On the left would be four brigades under the command of Pettigrew, followed up by Pender’s brigades under the command of Trimble. This was a combined force of 12,500 men that stretched for about one mile. 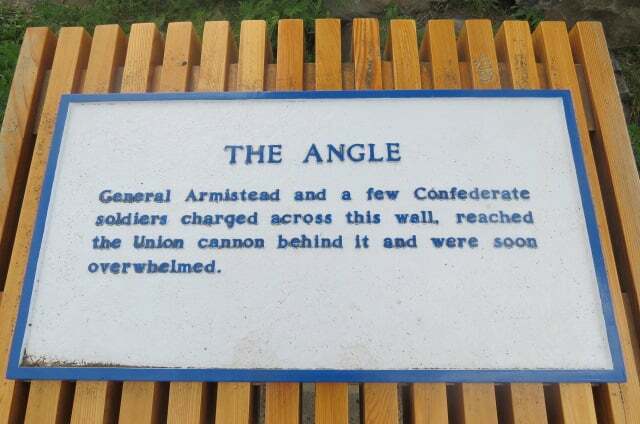 General Longstreet was very distressed with this attack at Gettysburg. He did not think it would be successful. he even tried to convince Lee to call off the attack. Longstreet argued that it would require double the amount of men and even then it was questionable whether it would succeed. His effort fell on deaf ears. Lee was determined to make the attack; he believed it had a good chance of success. different points on the battlefield and were not done at the same time therefore they failed. 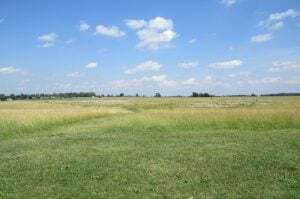 Essentially the attacks of July 2nd were many small attacks where Pickett’s Charge would be one massive attack aimed at one point in the Union line preceded with a massive artillery bombardment. Jeb Stuart and his cavalry would also play a critical role in the attack. 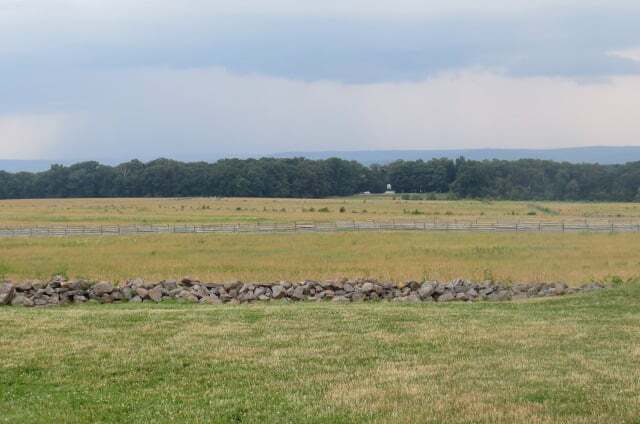 Stuart was to circle around the Union lines at Gettysburg and while the infantry was attacking the center of the Union forces Stuart and his cavalry would attack the Union center from the rear thus joining with their comrades and splitting the Federal forces in two. If this attack were to succeed the Confederates would undoubtedly win the battle of Gettysburg. General Lee felt confident it would be successful. 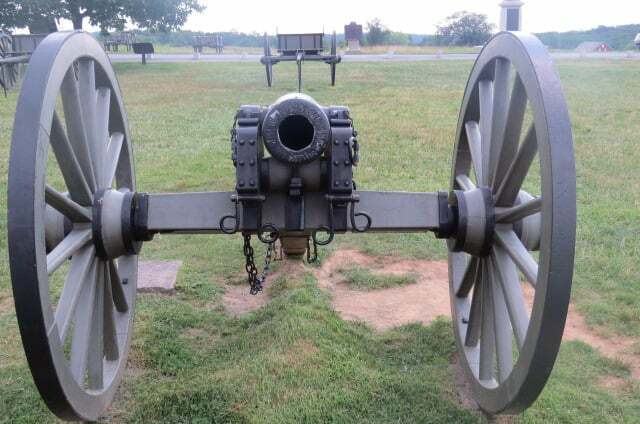 It was 1:00pm when the Confederate artillery began the first phase of the battle plan. Over 150 guns opened fire on the Union center. The Federals returned fire and the most massive artillery bombardment during the Civil War had begun. The sound was so loud the gunners ears bled. The barrage was so loud it could be heard as far away as Philadelphia and Baltimore. For over an hour the artillery duel continued. At a little past 2:00pm the Union began to slowly stop firing. This was a trick to deceive the Confederates into believing they had knocked out all the Union guns. The trick worked and at 3:00pm the Rebels stopped firing. They were also dangerously low on ammunition and needed to conserve it as much as possible. 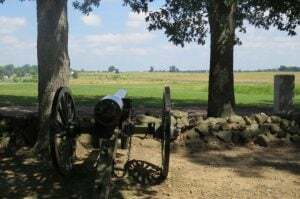 It was at this time the commander of the Confederate artillery pleaded with Pickett to attack now otherwise we will not be able to support you. Pickett rushed to Longstreet asking for permission to begin the attack. So despondent over the attack, which he knew would fail, Longstreet could do nothing more than simply nod his head and wave his hand to give the order to Pickett. Now was the moment that over 12,000 rebel troops emerged from the tree line and lined up in formation for the fateful march. 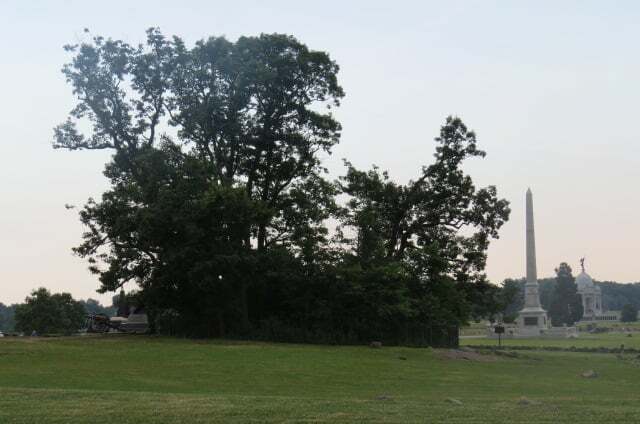 Their main focus was a little copse of trees behind the Federal lines, which you can still see today. General Pickett was in very high spirits and truly believed his men would be able to break the Union lines. The moral of his men was also high because they also believed the Federals would break. Pickett shouted to his men that they were all Virginians and to remember what they were fighting for. With this the Confederates started forward. The long gray line advanced toward those copse of trees at a steady pace. At first all guns were silent including the Federals. The Union troops were in awe seeing this vast force of humanity slowly but steadily approaching them. Halfway across the field Pickett’s division (which was not personally led by Pickett because he had stayed behind and was watching the battle with the rest of the commanders) performed a left oblique to close the gap between them and the rest of the units. This was when the Union opened up with their artillery on the advancing rebels. 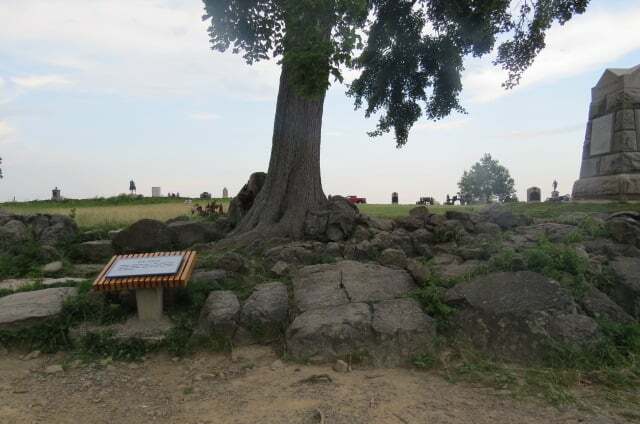 They fired from both Cemetery Hill and Little Round Top, slamming into both flanks. The Confederates finally reached the Emmitsburg road only to be confronted with a simple fence. This simple fence however turned out to be a very difficult obstacle. The Confederates were now in rifle range. They had to jump this fence and in doing so made easy targets for Union troops, the fence also broke up the formations and slowed the advance significantly. Picketts Charge – This is what a Union soldier saw. In the center is the fence that runs along the Emittsburg Road. Many of the Confederates never advanced beyond the Emmitsburg road pinned down by heavy Union rifle fire. Several hundred of them kept advancing and bravely pushed forward toward a low stonewall which was just in front of the little copse of trees, the goal of the southern attack. They had finally reached the Union line. This was the moment where the battle would either be won or lost. The rebels rushed the stonewall and brutal hand-to-hand combat quickly ensued at an angle at the wall. It was now that Confederate General Lewis Armistead famously put his hat on the tip of his sword and urged his men forward. Pushing the Union defenders back the rebels went forward over the stonewall. Armistead only had about 300 men following him at this point but still they pushed on. 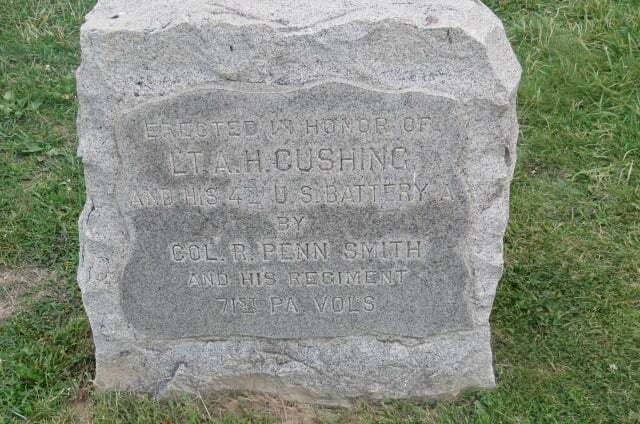 Here was an artillery battery commanded by Colonel Alonzo Cushing and while his men were falling back Cushing ran up to one of his guns to “give them one more shot” which turned out to be his last words. He was immediately shot in the chin and killed instantly falling over his gun. 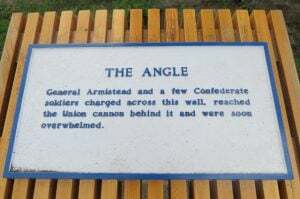 At this very moment was the “high water mark of the Confederacy” at the “ bloody angle”. This was the closet point the South ever came to winning the Civil War. 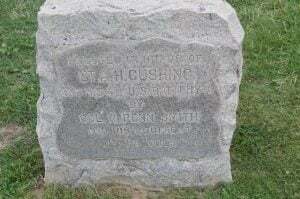 The rebels reached Cushing’s guns and Armistead now with his hat falling to the hilt of his sword urged his men to turn the guns on the Yankees. Before achieving this however Armistead was shot three times and fell to the ground. His wounds were not believed to be fatal, he was captured and taken to a Union field hospital for treatment. He died on July 5th. The cause of death is not officially known. The Union quickly poured in fresh troops to fix their broken line and counterattacked. 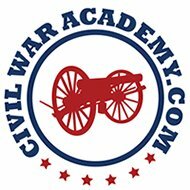 Jeb Stuart and his cavalry were suppose to meet the infantry attacking the Federals in the rear of their line. Stuart never showed up. He and his men ran into Federal cavalry commanded by George Armstrong Custer and were defeated forcing them to withdraw. The remaining men of Pickett’s Charge were overwhelmed by Union troops and forced to retreat. The rebels fled back to their original lines. It was all over. Pickett’s charge had failed. The attack was a disaster, over half of the 12,500 troops that started the attack were gone. They were dead, wounded, or missing. Pickett’s division only had 800 men left out of 5,000. Lee took full blame for this failure and greeted the troops as they returned back to the Confederate lines. He tried to encourage them to pick up rifles and prepare for a Federal counterattack, which he believed, would be forthcoming. The next day July 4th the two armies glared at each other across the open field. Lee still thinking General Meade would attack prepared a defensive line and hoped for an attack to come so he could do to the Union what the Union did to his men. Meade however had other ideas and decided that his troops had done more than enough at Gettysburg and did not launch an attack. With that the battle of Gettysburg ended. Four months after the battle Abraham Lincoln gave one of his most famous speeches, the Gettysburg Address. On the night of July 4th General Robert E. Lee and his Army of Northern Virginia left Gettysburg forever. 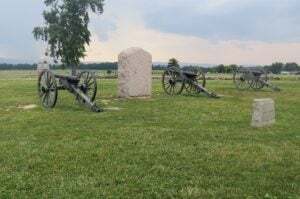 Against President Lincoln’s wishes General Meade did not attack the defeated Confederates and finish the job at Gettysburg. He essentially let the Confederates retreat, which ultimately led to his replacement as commander of the Army of the Potomac. The Union suffered 23,000 casualties and the Confederates suffered 28,000 casualties.